I "found" this quilt buried somewhere in the linen closet when I was teenager and asked if I could use it on my bed. My mom had little interest in it so off to my room it went. I did learn that it had come from my father's family. Sadly, I have no idea who made it. I've searched but have never found a signature. I wish I knew who she was--she stitched this quilt entirely by hand with amazingly tiny stitches. It's a beautifully crafted quilt. It's been heavily worn and is threadbare now. The fabrics have faded so it's hard to tell what they looked like originally. My best guess is that the majority of the quilt is muslin with tan, cheddar and a tiny bit of blue fabric. There is one block with blue pieces throughout (above) and one other block with a single blue piece. Clearly, it's all the blue fabric the quilter had on hand! Most of the blocks are cheddar and what looks like a light tan. The binding is this same tan color fabric. The quilt is 67 x76 inches. The blocks are (mostly) 9.5 x 9.5 inches square but some of them aren't true--see the block at top. The pieced blocks are comprised of nine patches. The center square in the nine patch has a variation of a Double Monkey Wrench block. The four corner blocks are the corners units of a Goose Tracks block. 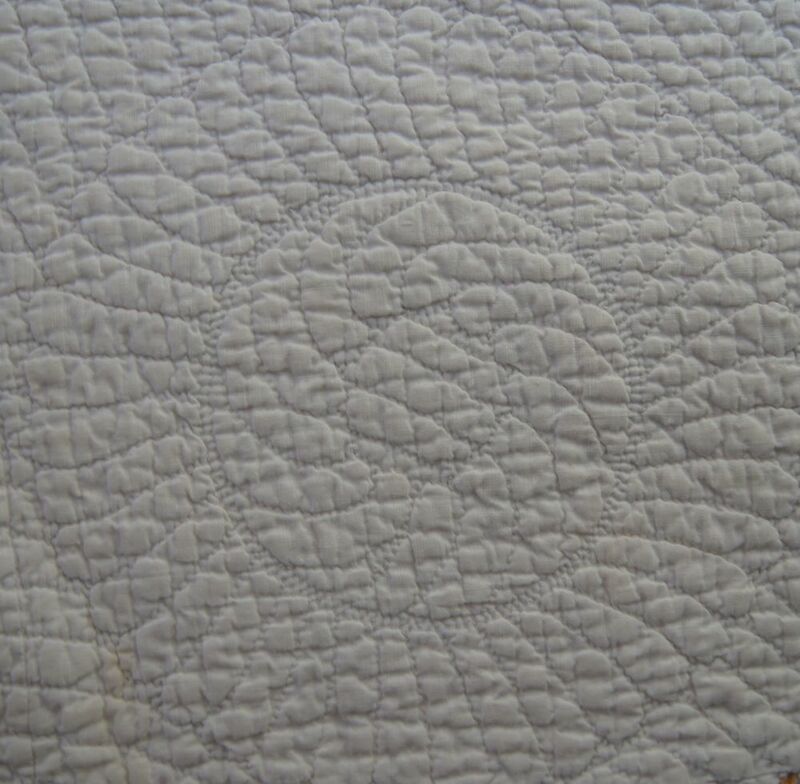 Typically, there is a small square block in the center of a Goose Tracks block but this quilter has substituted a pieced center patch, creating a very visually interesting block. 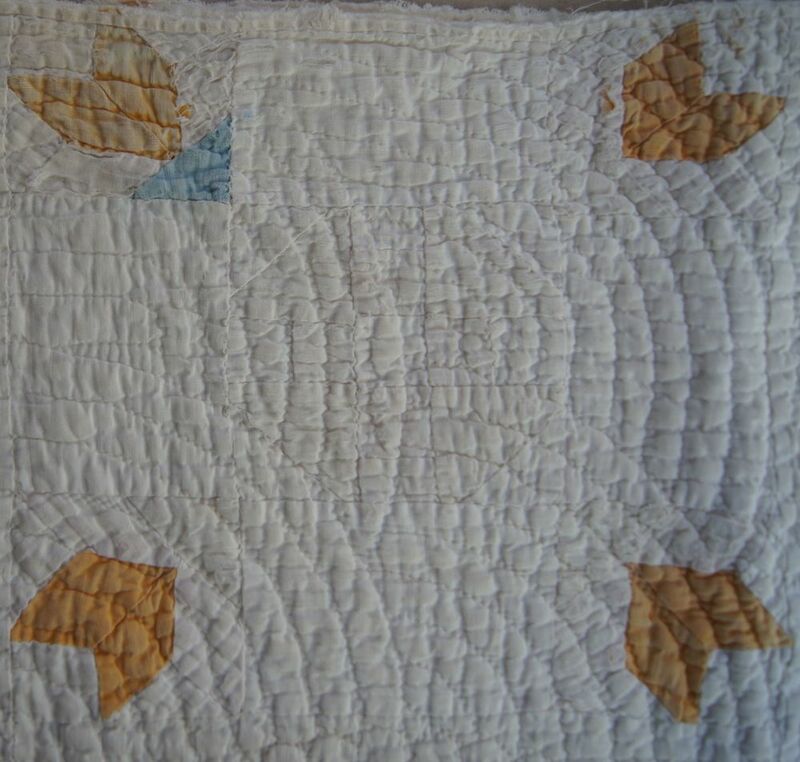 The pieced blocks alternate with a plain block with a circular feather quilting pattern. On each side of the quilt is a 4 inch plain border. There is no border at the top or bottom of the quilt. This quilt is now too fragile to use. But--I have the cheddar color fabric I picked up last year and a fat quarter of Koffman's Kona® Cotton "Periwinkle" which is a very similar blue. So I think I will try to make a lap size reproduction of the quilt using Kona fabrics. So, off my Electric Quilt 7 program to draft rotary patterns for these blocks! This quilt presents a few challenges, but it will be fun! Stay posted for my progress on this quilt!